You can NEVER have too many shoes. I have a junior apartment and most of it is dedicated to housing shoes (who needs a bed when you can have shoooooooes:). So when it's BOGO time (for those of you who don't know that's buy one get one half off) at Payless I usually redistribute everything in my place to accomodate my new half off finds. To my sheer delight I also found a coupon code for an additional 20% off (#39287). Yipeeee! I got some amazing pumps and didn't break my budget to do it. What more can you ask for? Ok, I am going too far but you gotta love a great deal on shoes. 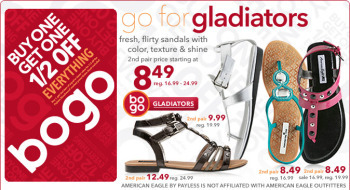 BOGO PLUS AN ADDITIONAL 20% OFF at Payless.com. Use code #39287. Get shoes sizes 5 to 13. Featured shoes: Fioni Madge Flat Over The Knee Boot ($44.99, far left), Fioni Loveit Overlasted Platform Pump in berry ($26.99, middle top left), Dexter Capri Snip-Toe Flat ($22.99, middle bottom left), Fioni Kamelia Exotic Platform Sandal ($24.99, middle top right), American Eagle Tevin Western Boot ($39.99, middle bottom right) and American Eagle Morgan Faux Suede Silver Wedge Boot ($39.99, far right). It's time to stock up on all of the spring and summer shoe trends. Payless.com has amazing styles and at buy one get one half off, amazing prices too. Don't wait because BOGO won't last forever. Click the pic to get fashionable and affordable shoes up to size 13. BOGO at Payless.com. Sizes 5 to 13. HURRY! ENDS MAY 3RD! It's BOGO time at Payless! Buy a cute pair of shoes at a great price and get the second for an amazing price at HALF OFF! Payless shoes go up to a size 13. Don't sleep on this one! BOGO at payless.com. Flats are shown however all shoes are buy one get one half off.